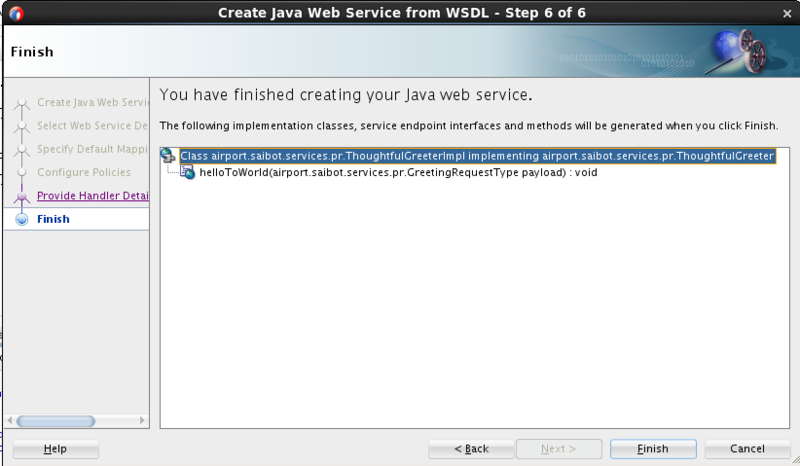 Set the name of the application – for example to AsynchronousJavaWebService – and the package prefix – for example saibot.airport.services.pr. Press Next. 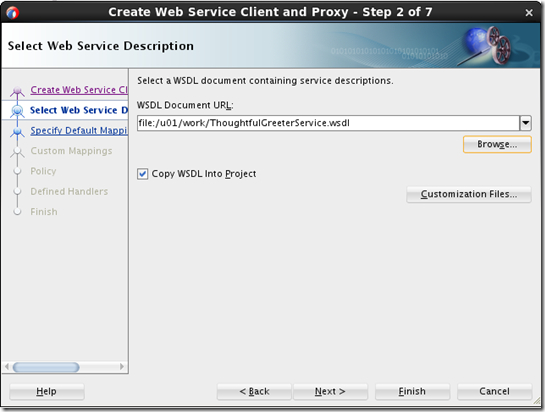 On page 5, set the name of the View project to WebServices. 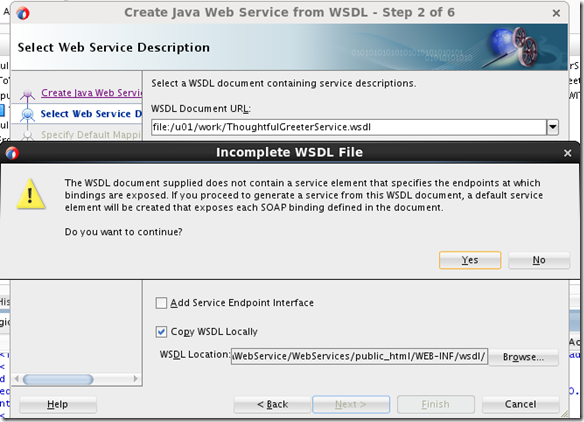 The WSDL contains two port types but no service element (it is abstract). 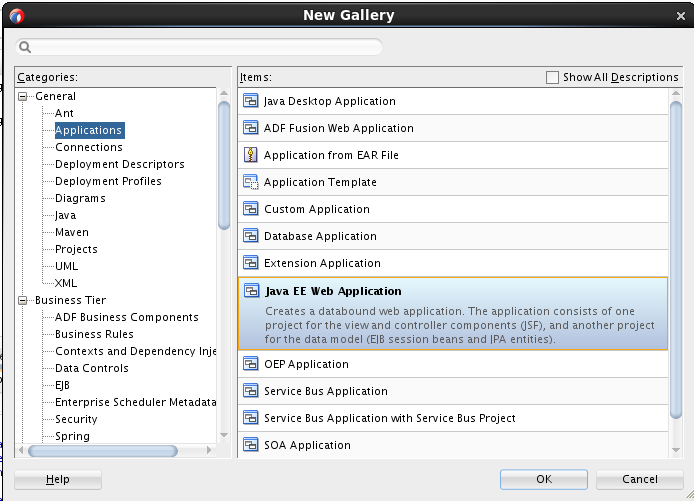 A warning will be presented by JDeveloper – about generating a default service element. Press Yes to accept this action. 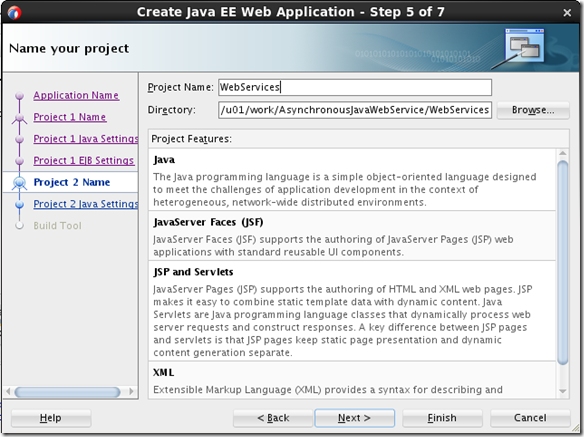 The last step presents an overview of what the wizard is about to generate. Press finish. 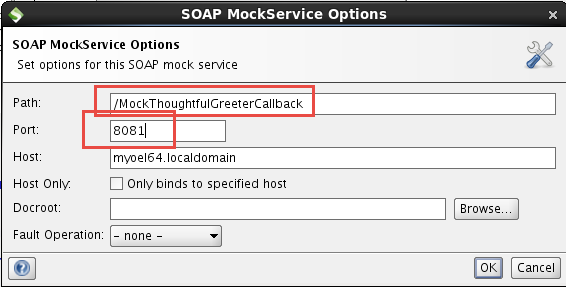 The proxy we have just created is intended only to invoke the Callback service to return the response to (asynchronously). 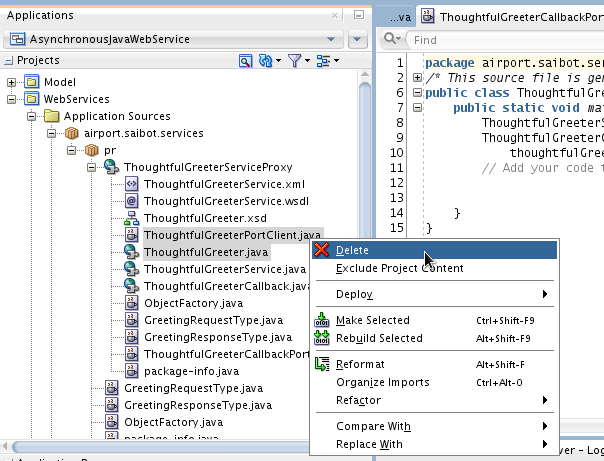 The classes ThoughtfulGreeterPortClient and ThoughtfulGreeter are not required to the call back – and can be removed from the project. The usages are presented. Proceed with the removal. Note: To prevent us from having to remove unwanted stuff later on, I have commented out the callback binding and portType in the WSDL document before running the Java Web Service wizard. 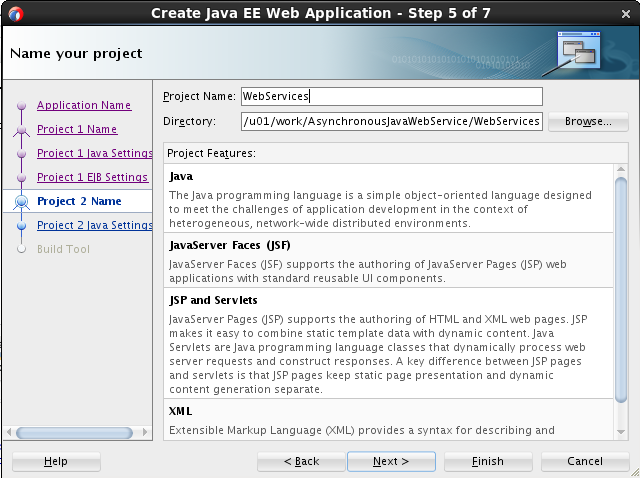 Press Finish to have the Java Web Service generated. 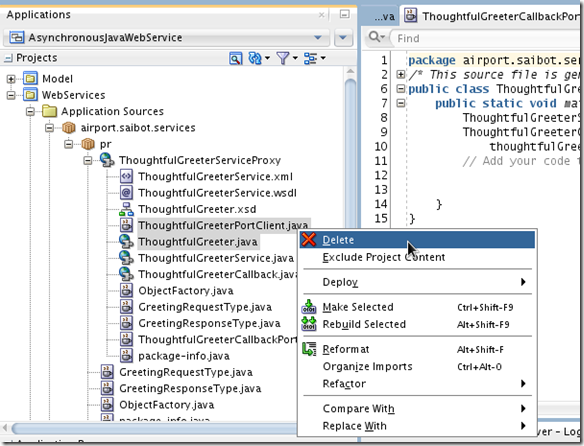 in order to create the response and invoke the callback interface – used on WS-Addressing details in the request.Open class ThoughtfulGreeterImpl. 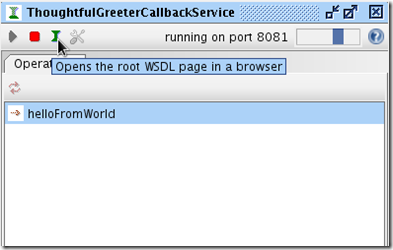 Add method callbackToHelloFromWorld to ThoughtfulGreeterImpl Class. 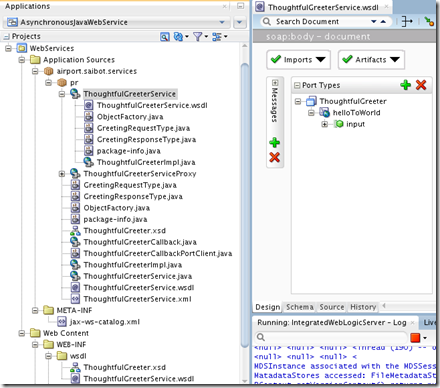 This method uses the ThoughtfulGreeterCallback Port on the ThoughtfulGreeterService to invoke the callback service. The message context, retrieved from the WebServiceContext, contains the endpoint address at which the invoker of the one way helloToWorld operation suggest the callback interface is exposed. 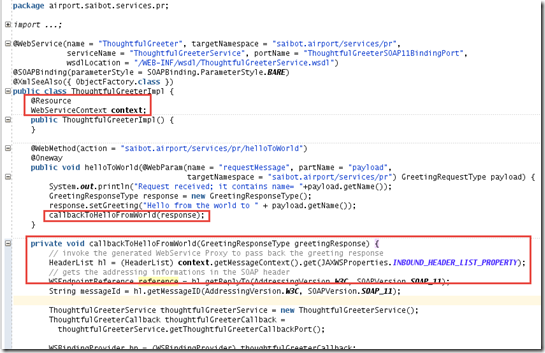 It also contains the messageId that is to be sent in the callback call to allow the consumer of the asynchronous service to complete the correlation of the response with the original request. 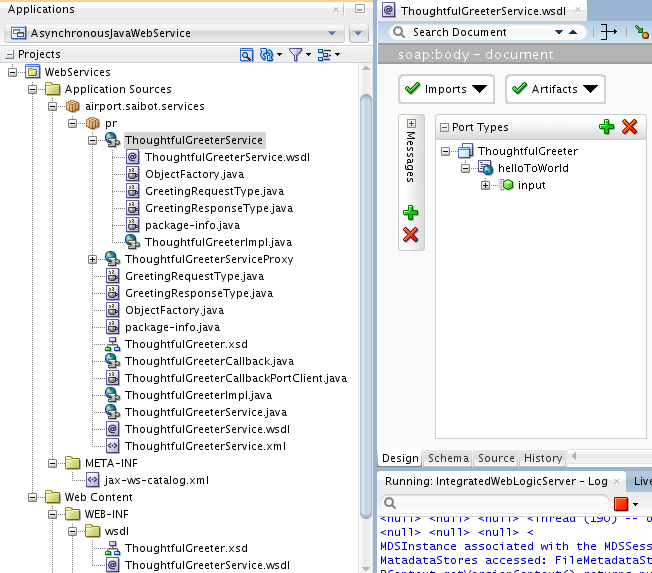 Right click on the ThoughtfulGreeterService and select Run from the context menu. 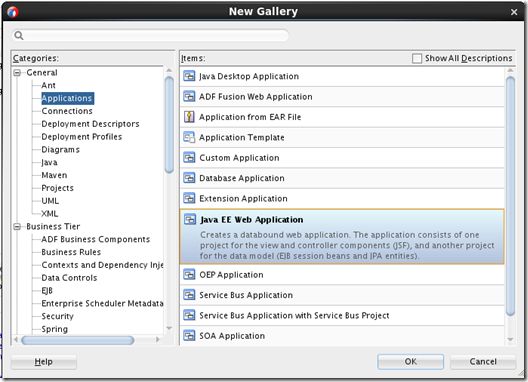 This will make the application be built and (re)deployed. 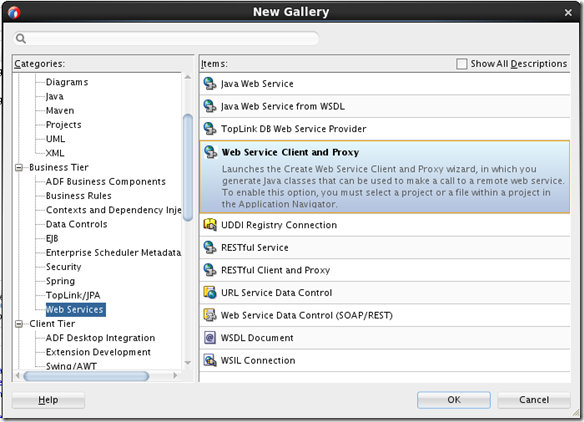 The console then shows (again) the address at which the service is available. 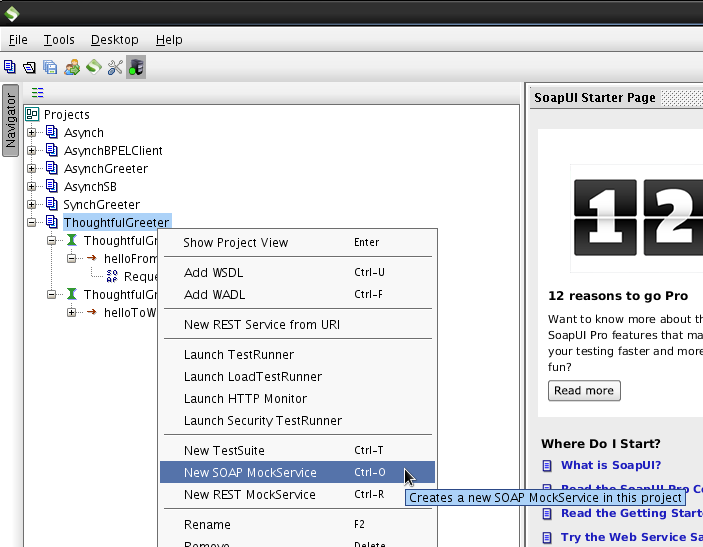 SoapUI is a good for testing web services – SOAP and REST – other services as well. 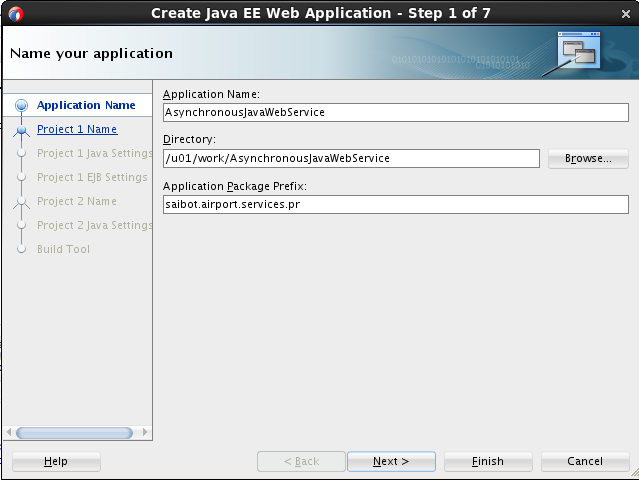 It can handle XML and JSON and other payloads. It can deal with asynchronous services – because it can expose the callback interface to which the asynchronous response is to be returned. 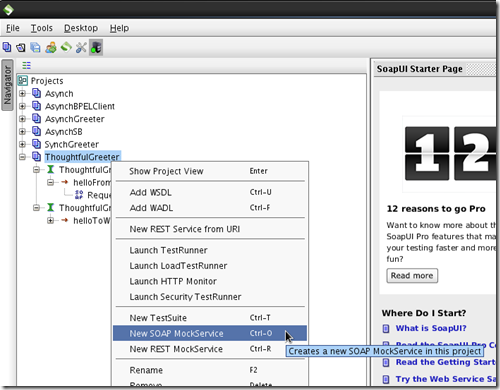 We will look at SoapUI in our current example. 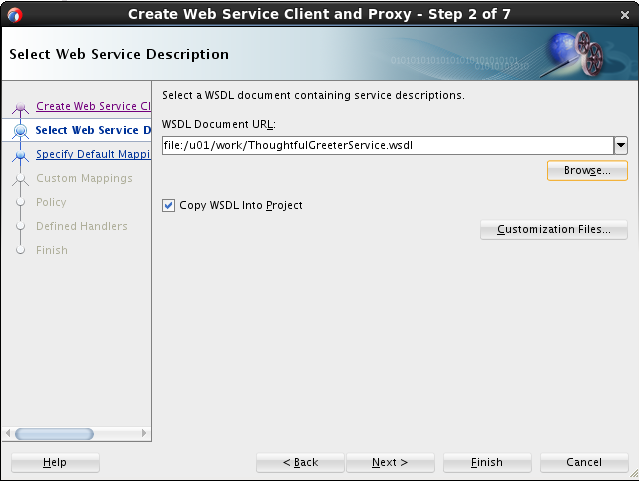 Create a new SoapUI project – based on the WSDL document exposed by the deployed ThoughtfulGreeter service (at the address shown as Target URL in the console after deployment – with ?WSDL added at the end): http://localhost:7101/AsynchronousJavaWebService-WebServices-context-root/ThoughtfulGreeterSOAP11BindingPort?WSDL). 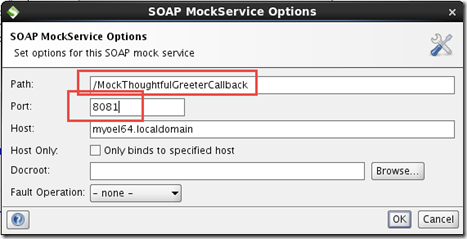 Next, we need a MockService in SoapUI – to implement the callback interface (PortType ThoughtfulGreeterCallback) for the ThoughtfulGreeterService. 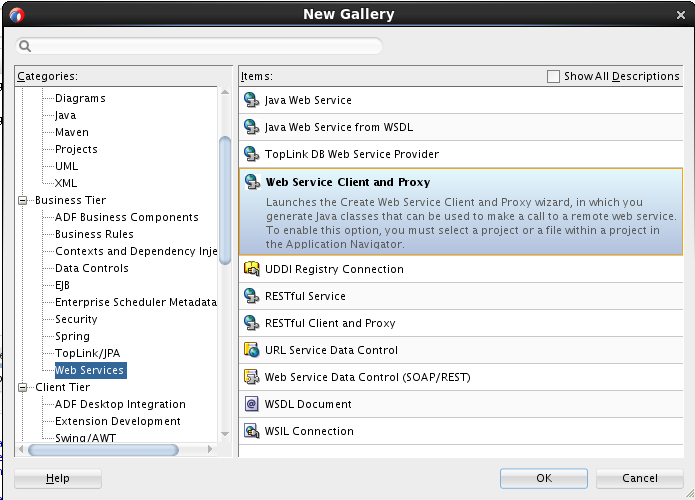 Right click on the project in SoapUI. 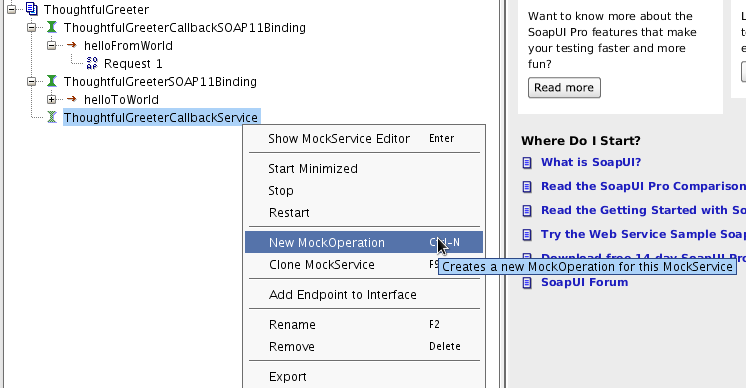 Select New SOAP MockService from the context menu. 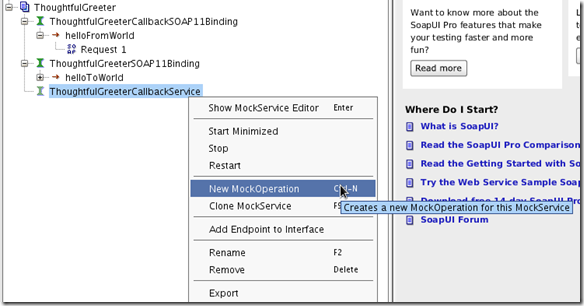 Add a MockOperation – from the context menu on the MockService. Start the Mock Service. Note we do not have to specify a response message for this mock service and operation. 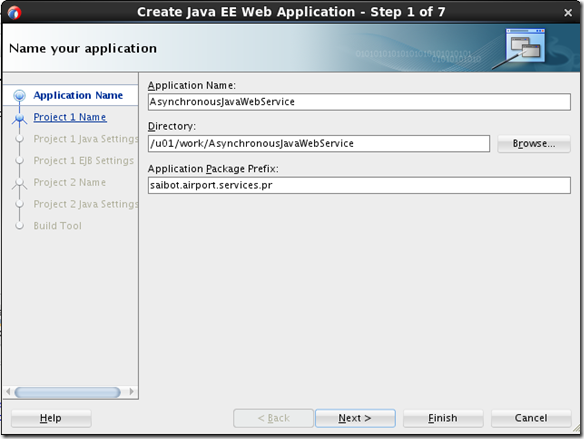 The operation is one-way – only to be invoked in order for the asynchronous service to deliver its response. 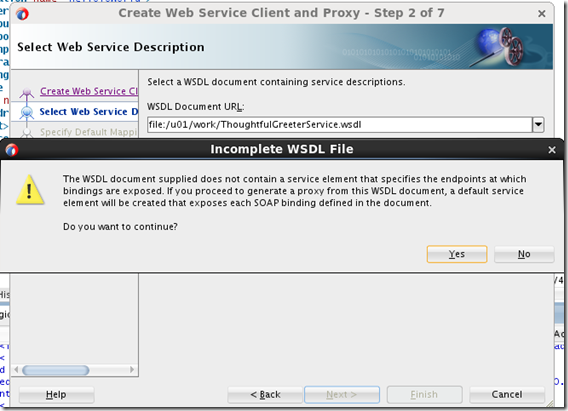 Copy the endpoint url (minus ?WSDL) to the clipboard. 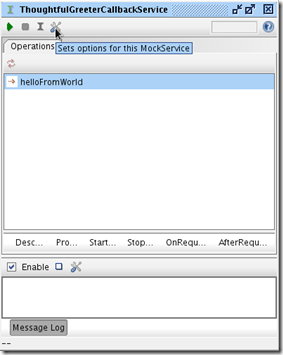 Open the Test Request for the helloToWorld operation. 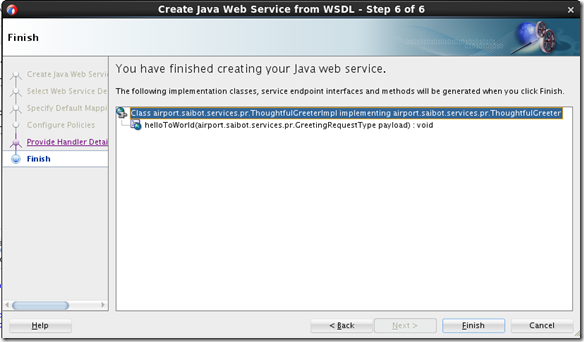 Set the endpoint to the endpoint found in the JDeveloper console after deployment. 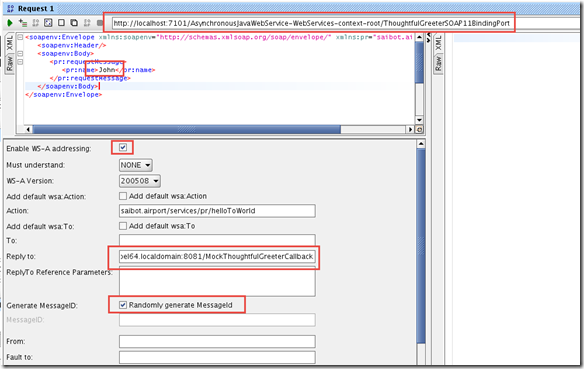 Set a value for the name element in the request message. Open the tab for Addressing details. 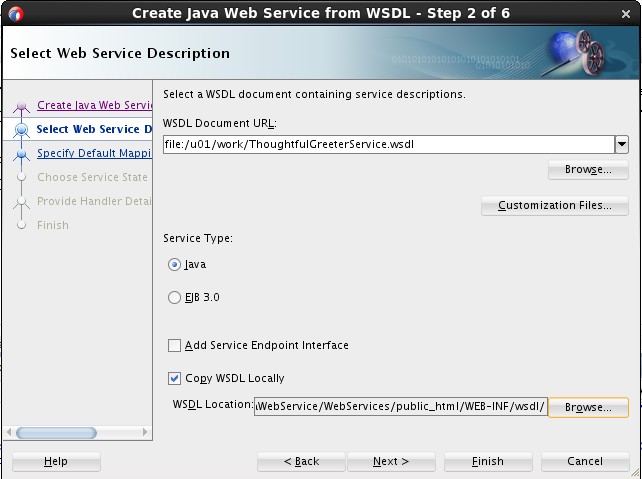 Check the checkbox labeled Enable WS-Addressing. 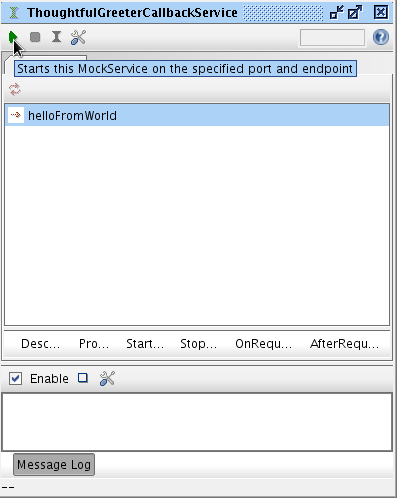 Set the ReplyTo property with the endpoint address in the clipboard buffer (copied from the WSDL page for the Mock Service). 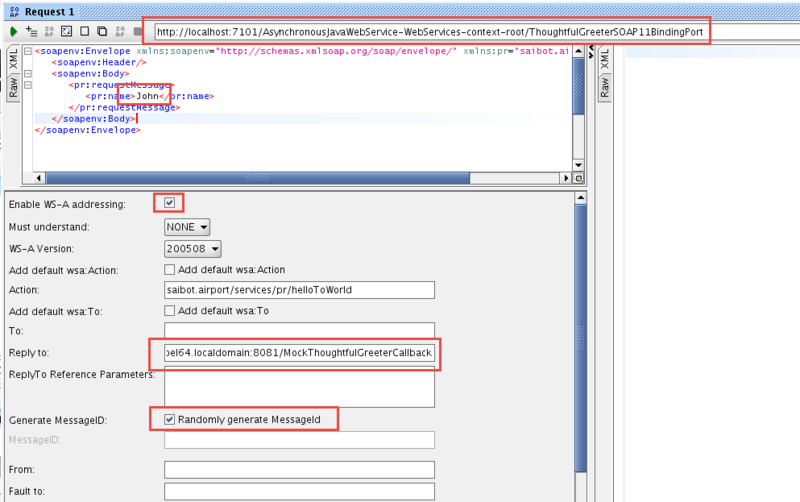 Check the checkbox labeled Randomly generate MessageId. 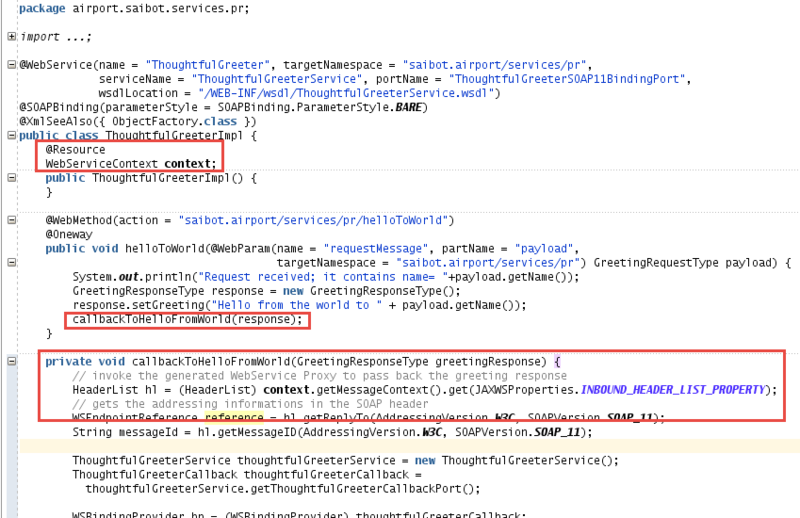 This basically means that SoapUI will add several WS-Addressing headers to the request it sends to the ThoughtfulGreeterService – including one for the ReplyTo address (the callback endpoint) and the message id to be used in the callback. 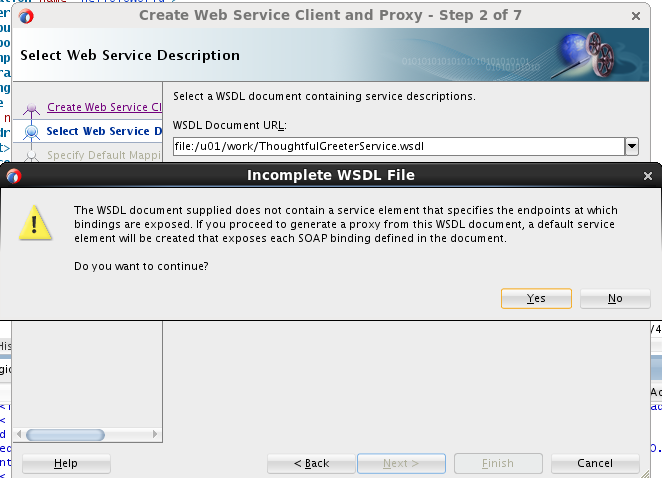 Now make the call from SoapUI. 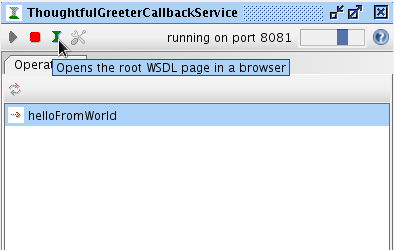 Clearly the JAX-WS Web Service was invoked and the request had headers with a callback address and a message id. 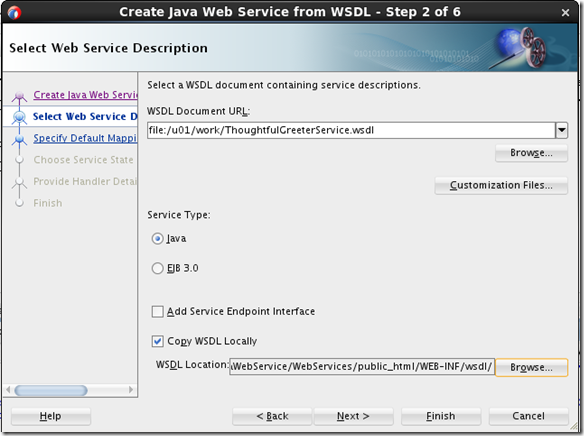 Dit bericht werd geplaatst in Java en getagged asynchronous,callback,Java,Java EE,jax-ws,messageID,oneway,replyTo,Soap UI,WS-Addressing,wsdl door Lucas Jellema . Bookmark de permalink . Brilliant! I found it VERY helpful. Thank you for this article! !